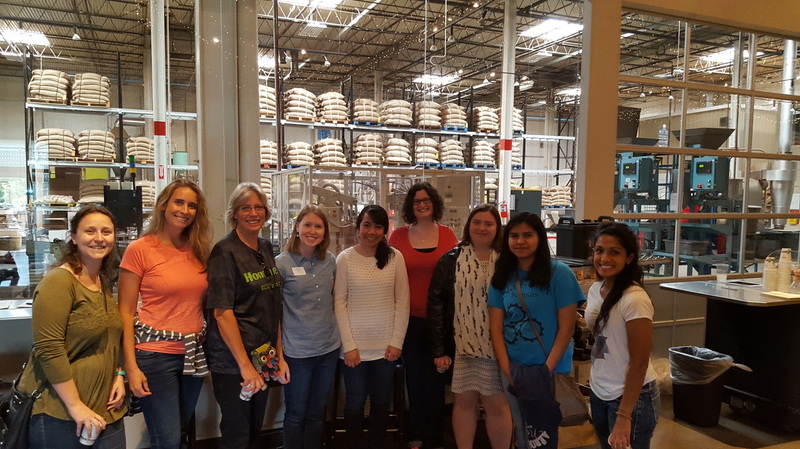 In late April, SWE-KC organized an annual networking event with 10 other STEM organizations in the Kansas City area including: SHPE, ASCE, KCWIT, WTS, JEC, IISI, MSPE, APWA, WiSTEMM, and Civil Air Patrol. 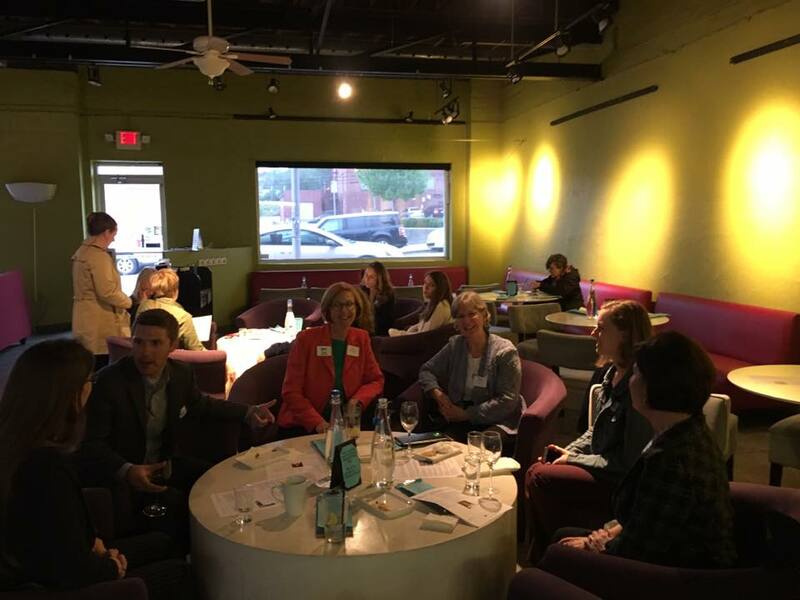 The event was held at Snow & Co for the first time, and I enjoyed trying some of the delicious frozen cocktails while mingling with people and learning about all these different organizations. Towards the end of the event, each sponsor had the opportunity to share a little about their organization. I always find it interesting to hear about many of the common objectives each of our organizations have, most commonly the reaching out to younger kids to teach them about STEM opportunities. IGED 2017 was held on Friday March 3. Approximately 270 high school girls attended along with ~90 professional female mentors. The girls were each matched with a mentor throughout the day, as they learned more about engineering. The day started off with an engineering discipline fair and industry fair. Then, they used their ingenuity and teamwork skills to build a free-standing “gumdrop structure” with various household supplies (ie popsicle sticks, toothpicks, straws, index cards, etc). The girls tested their structures with sandbags as weights. The winning team’s structure amazingly held 36 sand bags – that’s ~18 pounds! After lunch, the girls heard from keynote speaker, Tara Ruttley, PhD. Ms. Ruttley works for NASA, and had some incredible stories about her experiences as a rocket scientist. Her talk was a highlight of the day! To close out the event, the girls heard from our college panelists, and were able to ask any questions about going to college and majoring in engineering. Overall, it was a great day and we hopefully inspired several young women to pursue a career in engineering. Thanks to all of our sponsors, volunteers, and attendees who made this event possible! This was my first SWE conference that I’ve ever attended. I really had no idea what to expect. I was open to a new experience, and hoped to learn something that could help me. I carpooled there with three other Honeywell employees, and the car ride alone helped me connect with people that I’d worked with, but didn’t really know outside of work. So that was really great! Our first agenda item was to attend the Busch stadium tour. We got there 30 minutes late due to St. Louis construction crews that stopped traffic to repair pot holes for 40 minutes. Needless to say it worked out fabulously because we got our own private tour with Jay! He took us to see places that the normal tour didn’t go. For example, we got to see the owner’s suite, the TV monitor room, radio announcer’s room, locker room, practice batting cages, and the dugout. It was a great time! There are many things that I’ve taken from the conference. I was encouraged to hear from Ed Purvis, COO of Emerson Electric, Inc., that Emerson sees the value of having women engineers and leaders in their company and has taken action to retain them, which is showing to be successful. I’ve taken many notes from Sunita Lavin’s presentation about the WBF, Women’s Business Foundation, in which Garmin has created. She took us through their mission, growing pains, lessons learned, examples of events that they have, and their successes. I took a lot from that and plan to bring these ideas to Honeywell FM&T. I also took away some learning points from Dorothy Tannahill-Moran, aka the Introvert Whisperer’s, presentation, “How to Authentically Self-Promote Without Being Obnoxious.” She mentioned five methods to help promote yourself. 2) Start with your results, not your title when you introduce yourself. What does Technical Manager really mean?? 3) Give updates to your manager. They don’t have to be formal. They can be as simple as when you pass them in the hall. 4) Make others a hero. Make it a point to recognize others when they do something great. 5) Volunteer. Use your capabilities and skill. I plan on incorporating some of these steps in my daily routine and also will share them with my team. Finally, the most important thing that I got from this conference was a chance to meet other women from the Kansas City area and broaden my network of professionals. It was a great experience, and I look forward to attending in the future. 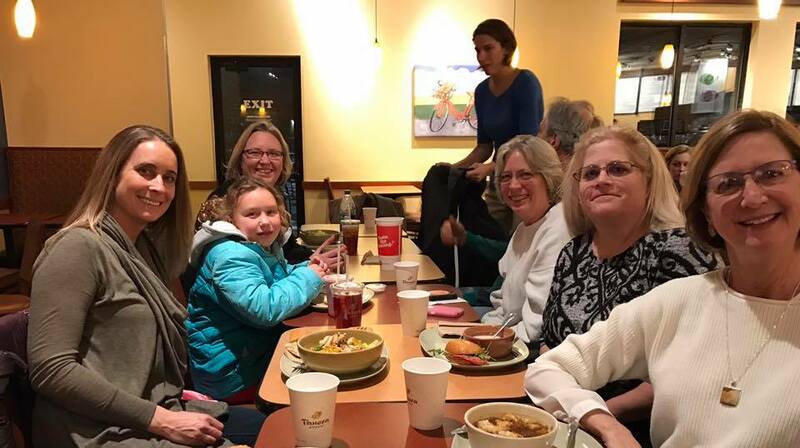 ﻿SWE-KC Night at the Movies: "Hidden Figures"
On January 8, SWE-KC members met to watch one of the first showings of the movie, “Hidden Figures”. The movie, based on Margot Lee Shetterly’s book of the same title, presents the story of three African American women working at NASA in Hampton, Virginia in 1962 when John Glenn became the first American to orbit the Earth. The three brilliant and ambitious women portrayed had to fight their way into a white man’s world to use their mathematical, computational, and engineering skills within the NASA environment. As a 56-yr-old engineer, I could relate to some of the situations where the women were mistaken for non-professionals. As the movie progressed, I became so proud of these women that made a break-through for not only women, but African Americans in the predominately white-collar, white work world. The other movie-goers felt the same pride as many gave a round of applause at the end of the movie even though there were no live actors in the audience. Many of us have done our own fact checking and have not found anything factually inaccurate, although the author of the inspiring book noted that, “They really did a big Hollywood rollicking adventure," suggesting some creative liberties were taken in making the movie. The central character, Katherine Johnson, is said to have seen the movie and liked it. It is a great movie for history buffs, women, African Americans, other minorities, and anyone looking for inspiration under intimidating circumstances. For those who braved the brisk wintery weather on December 8, the SWE Cookie Exchange provided an evening of great conversations, rapid-fire holiday Pictionary and a lively White Elephant gift exchange. And that’s all before we got to sample and exchange an amazing assortment of holiday cookies! The winning cookies were impeccably hand-decorated white and silver snowflake sugar cookies (made by Hilary Zerr) that were almost too beautiful to eat! A big thank you goes out to Suzie Carpenter and Kaeisha Akinmoladun for coordinating and hosting this event and to Black and Veatch for providing the venue. 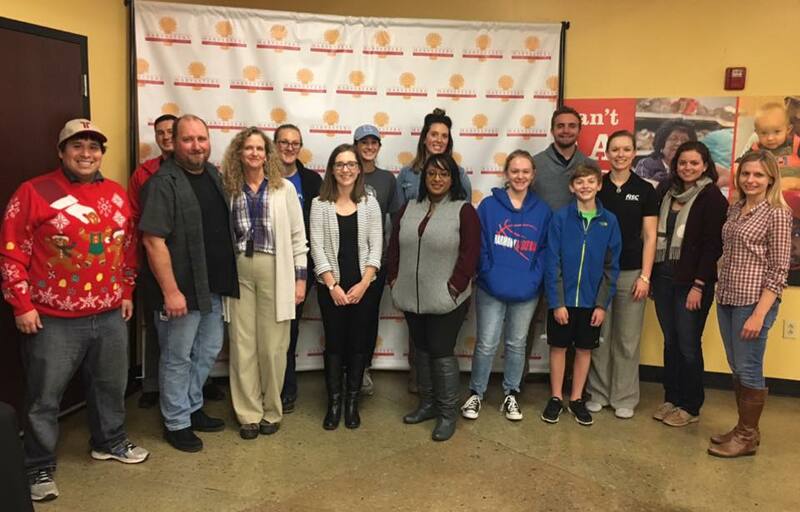 On November 29, 2016 a group of people from the KC sections of SWE and ASCE volunteered at Harvesters, Kansas City’s regional food bank. Harvesters’ mission is to feed hungry people today and work to end hunger tomorrow. Harvesters serves a 26-county area of northwestern Missouri and northeastern Kansas. Harvesters provides food and related household products to more than 620 not-for-profit agencies including emergency food pantries, community kitchens, homeless shelters, children’s homes and others. They also offer education programs to increase community awareness of hunger and teach about good nutrition. I’ve known about Harvesters for a long time. I put items in their barrels when I see them in stores. I scour my shelves for non-perishables to send with the kids to school for food drives. But this was my first invitation to hands-on volunteer at their facility. There were about 12 or 13 in our group so they split us in to two groups. My group started boxing up containers of bleach, cleaning supplies and laundry supplies into ~25 pound boxes. Stacking the boxes on pallets until they were 4 high. In the first hour we boxed up all they had and filled more than 2 pallets. Next they moved us to food in glass containers. For the next hour we filled boxes with at least 20 pounds of glass containers – jars of jelly, spaghetti sauce, pickles, baby food – an amazing array of food. As I picked out different kinds of food to put in each box I wondered about the people who would receive it. Would they have little kids who really wouldn’t like pickled beets? Would a struggling single parent with teenagers get a box with baby food in it? My husband went with me. One woman brought her son (~10) and daughter (~13) with her. They worked hard. When I told my 23 year old where I was going that night she said she wished she’d known. She would have liked to come too. Was it fun? Not so much. Was I glad I went? Definitely. I plan to volunteer again next year and I’ll be bringing my kids with me. On Friday, November 11, the Society of Women Engineers hosted the first annual Introduce a Girl to Engineering Day Jr. (IGED Jr.) at University of Missouri-Kansas City's Pierson Auditorium. IGED Jr. is an all-day event for 6th through 8th grade girls to receive an introduction to engineering through hands-on activities, a keynote speaker and industry professionals. Once the students arrived at UMKC, they participated in "Minute to Win It" icebreaker activities and paired up with their assigned industry professional and a student from another district. The students were given an overview of different types of engineering before diving into the first hands on activity, Slime! While making Slime, the students learned about the properties of Non-Newtonian fluids. Valerie McCaw, President of VSM Engineering, presented the students with her story of becoming an engineer and the challenges she met along the way. The afternoon was filled with a bridge building competition. The students were challenged with building a bridge with a limited amount of supplies that could hold 4 engineering textbooks. The winners built a bridge that could hold 11 engineering textbooks!! We had 79 students, 41 mentors and 12 volunteers present for the event. Over 12 SWE-KC members attended the SWE Annual Conference in Philadelphia in October. Several members were also speakers at the event, including Kerrie Greenfelder, Sunita Lavin, Adriana Porter, and Una Nowling. We also were honored to have 2 SWE-KC members recognized at the SWE Awards Banquet for the first time in many years. Sunita Lavin received the Distinguished New Engineer Award. Shelley Wolff received the Advocating for Women in Engineering Award. Congrats ladies! WE16 was an outstanding experience again this year. This year I attended as tourist, SWE-KC Section Representative, job seeker and celebratory friend. This year WE2016 was held in Philadelphia, Pennsylvania. I had never been to this city and was excited to be a tourist and explore the city. My first day at conference, I took a Philly foods tour. I ate tomato pie, hot soft pretzels, cheese whiz fries and of course a famous Philly cheese steak. Next I was able to walk to see the Liberty Bell and Independence Hall. My biggest surprise was that the Liberty Bell was not as big as I had thought it was going to be. I was able to attend conference this year because I am SWE-KC Section Representative. I attended the Region i meeting where I was able to meet other Region i representatives face to face. This was a nice change because generally our monthly meetings are conference calls and we never see each other. I was able to spend some time and get to know our St. Louis representative which is great because iCON17 will be held in St. Louis and will see her there for sure. This year was the first year I attended the career fair as job seeker. My biggest learning was that on the second day the career fair opens an hour early just for professionals looking for new opportunities. This hour was great because interview lines were greatly reduced. It was also nice because companies were more focused and prepared to talk to professionals about current open opportunities. During the career fair I was able to speak and interview with several companies I was very interested in. Finally, this year was the first time I attended the awards ceremony and cheered fellow SWE sisters on. 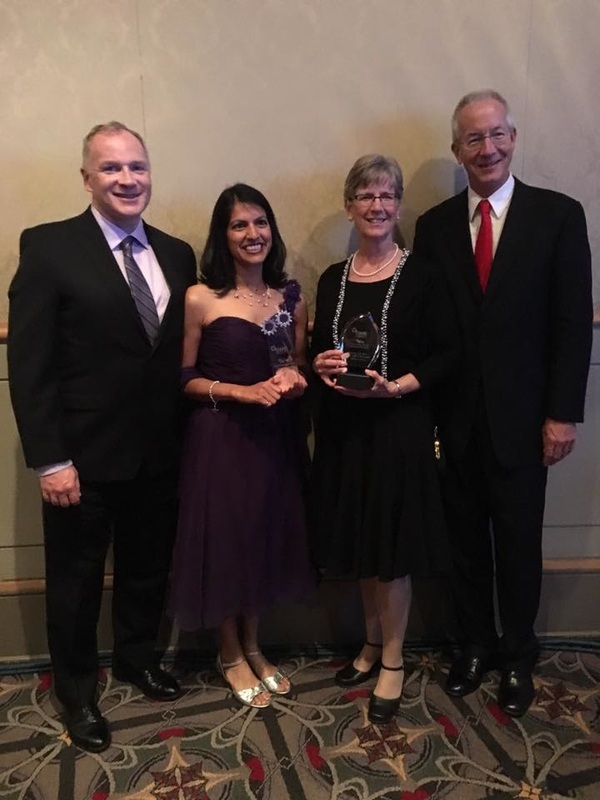 SWE-KC members Sunita Lavin and Shelley Wolff received national awards. Sunita received the Distinguished New Engineer Award and Shelley the Advocating for Women Award. It was my favorite part of the conference. WE16 was a great experience. I hope to attend again next year in Austin, TX! The thing I love about Annual Conference is being among motivated and inspirational women engineers from all around the world. With over 11,000 female engineers, WE16 did not disappoint. My favorite part of the conference was meeting Stueti Gupta who was a fellow Distinguished New Engineer recipient. Stueti came all the way from Pune, India, to attend WE16. Among her many accomplishments was starting the first SWE affliate in India. How amazing is that! Although Indian female engineers share many of the same challenges as women engineers in the USA, they also have unique cultural challenges. For example, often when a female engineer gets engaged, she hands in her resignation with the explanation that "I'm getting married." Most Indians would just nod at that, but the SWE's Pune affliate is trying to get women to question that kind of attitude. WE16 really helped me think about worldwide perspectives, and how SWE is making a difference around the world. 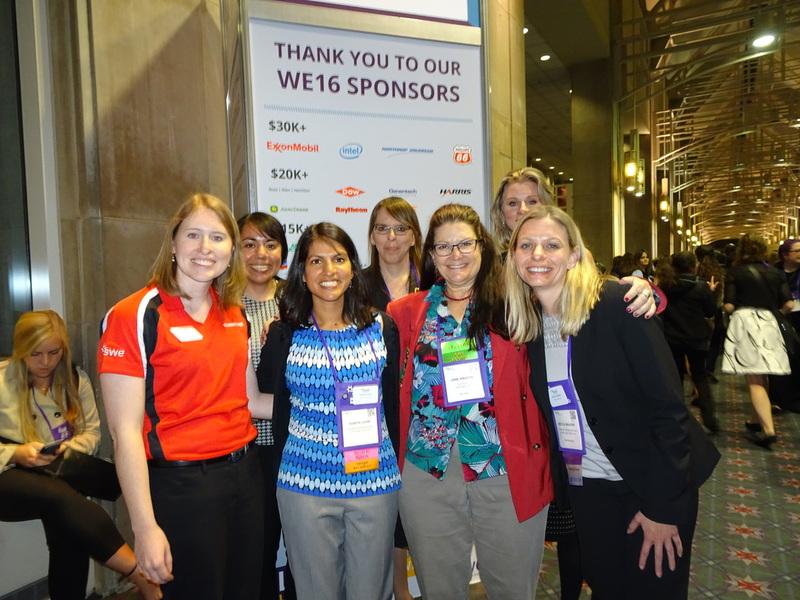 WE16 was my 7th SWE Annual Conference! However, it was my first time to represent my company to help with interviewing candidates. I was very excited to help with the Honeywell recruiting team, and I felt a lot of pride for being a part of a company that had such a huge presence at the SWE conference. I also enjoyed networking and meeting many other Honeywell women from across the country. During my first day at the conference, I was inspired by Luann Purdy’s keynote. She offered a lot of personal advice for women trying to succeed in engineering and leadership roles. My second favorite part of the conference was attending the Friday night Awards Banquet. It was my first time attending the awards banquet, and I was eager to attend to cheer on SWE-KC members, Sunita Lavin and Shelley Wolff, as they each received a SWE Award. On Saturday of the conference, I met up with my sister, who is a mechanical engineering graduate student at the University of Michigan. Since I don’t see her very often, we had a good time catching up and doing some sightseeing around the Philadelphia area. We checked out the Liberty Bell, ate lunch in Reading Terminal Market, and we took our first Uber ride to the highly recommended “Jim’s on South Street” to try our first Philly cheesesteak. We finished out the evening with a nighttime stroll near some historic Philadelphia sites, including Betsy Ross’s house and Ben Franklin’s grave. Last weekend, I attended the SWE-KC and KU joint networking event at The Roasterie. Since the event started around lunchtime, I decided to try out The Roasterie’s Food Truck Brunch before the event. There were three different food trucks offering both breakfast and lunch options, including chicken & waffles, pizza, wings, and even some Cuban food. It was a gorgeous day, and I enjoyed eating my lunch outside and listening to the live guitarist. I finished my lunch and entered The Roasterie Café just in time for the 12:30 tour to start. I found a couple of the SWE-KC ladies and we started the tour with an introductory video. We then proceeded on the tour and learned a lot about air-roasted coffee. Our tour guide was very informative and captivated the audience with his clever jokes. Along the way, we met several KU SWE members, and we had some time to network with them at the conclusion of the tour. Two of the KU SWE members were seniors and getting ready to enter the workforce, and others were freshmen. We encouraged them to consider attending upcoming SWE conferences, including the Region Conference in St. Louis in February. 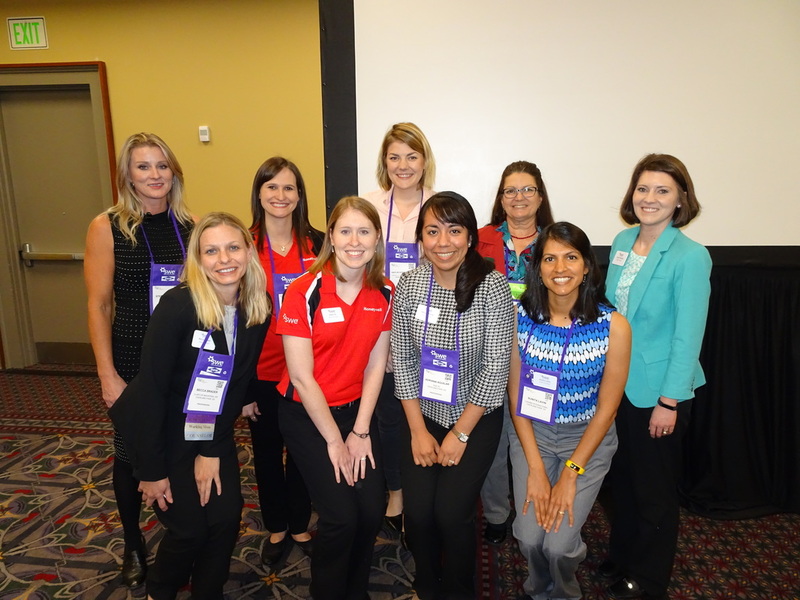 It was a great opportunity for SWE professional members to network and mentor collegiate SWE members. There was even some mentoring happening between the seniors and the freshmen students. In August, I attended the Region i Leadership Summit in Oklahoma City, on behalf of our section. The leadership summit is open to at least 2 section leaders or members who are interested in attending each year. It is a great opportunity to learn more about SWE, meet other SWE leaders from around our region, and learn some great information to help us kick-start the year! After the long 5 hour drive to Oklahoma City, I was instantly greeted at the hotel by some familiar faces. It was great to see several region i SWE friends that I typically only see twice a year at the Annual and Region Conferences. The leadership summit started off on Friday evening with a networking hour (and cocktails from the hotel), where I was lucky enough to sit at a table with collegiate officers from nearby universities including UKMC, K-State, and Mizzou. This was followed by a couple sessions about SWE Leadership and the SWE Strategic Plan. The next day consisted of more fun and fact-filled sessions, including topics on fundraising, region tactical planning, professional section officer training, and much more! I learned a lot of great information and ideas to take back to our section to start planning for the year. The weekend wasn’t all SWE business though. We even had some time for a scavenger hunt and dinner at Urban Johnnies on Saturday evening. It was a great way to see the sights of Oklahoma City! This blog will share pictures and details from SWE-KC's recent events. We will highlight our outreach events, meet & greets, professional development events, and recognition. Contact us at swe.kc.mail@gmail.com if you have something to share on our blog.